Greenleaf Book Group Press, 9781626341135, 266pp. As an aviation pioneer, Carey D. Lohrenz learned what fearless leadership means in some of the most demanding and extreme environments imaginable: the cockpit of an F-14 and the flight deck of an aircraft carrier. Here, her teams had to perform at their peak--or lives were on the line. Faltering leadership was simply unacceptable. Through these experiences, Lohrenz identified a fundamental truth: high-performing teams require fearless leaders. Since leaving the Navy, she's translated that lesson into a new field, helping top business leaders, from Fortune 500 executives to middle managers, supercharge performance in today's competitive business environments. 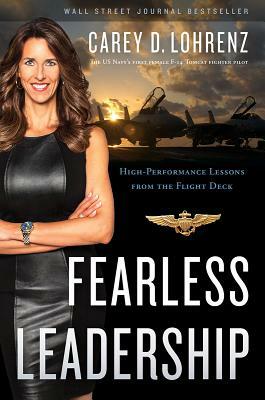 In Fearless Leadership, Lohrenz walks you through the three fundamentals of real fearlessness--courage, tenacity, and integrity--and then reveals fearless leadership in action, offering advice on how to set a bold vision, bring the team together (as wingmen, not Top Gun mavericks), execute effectively, and stay resilient through hard times. Whether you're stepping into your first leadership role or looking to get out of a longstanding rut, Fearless Leadership will act like your afterburner--rocketing you to ever-higher levels of performance. Carey Lohrenz, the first female F-14 Tomcat fighter pilot in the US Navy, has flown missions worldwide as a combat-mission-ready pilot. Today, her knowledge and experience in leading high-performing, diverse teams, has made her a highly sought-after business consultant and leadership speaker. She has appeared on CNN, MSNBC, NBC, CBS, ABC, and NPR, and in Time magazine and the Huffington Post.Carey has delivered her training and keynotes to such companies as AT&T, Black & McDonald, Cisco, Comcast, Covidien, Kimberly-Clark, New York Life, Lincoln Financial, Prudential, Safeway, Sanofi, Southern California Edison, State Farm Insurance, Sea Ray Boats, Sprint, the Texas Workforce Commission, TripAdvisor, Underwriters Laboratories, Walmart, and Wells Fargo Advisors, to name a few.Carey graduated from the University of Wisconsin, where she was a varsity rower, also training at the pre-Olympic level. After graduation, she attended the Navy's Aviation Officer Candidate School before starting flight training and her naval career. She is currently working on her MBA in Strategic Leadership.